Parthenolide has shown great promise in treating multiple cancers, though admittedly not in human testing. It works by reducing the spread (metastasis) or the recurrence of several types of cancerous cells, including breast, prostate, lung, bladder, leukemia, and myeloma. Harikrishna Nakshatri, associate professor of surgery, biochemistry, and molecular biology, and Marian J. Morrison, an investigator in breast cancer research, has discovered that parthenolide could block the activity of a protein called NF-kB in breast cancer cells. NF-kB promotes the production of proteins that block cell death. In moderation, that’s a good thing, but when NF-kB becomes overactive, cancer cells become resistant to chemotherapy drugs. 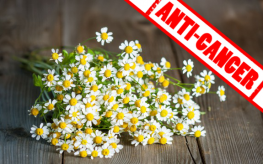 Fortunately, the active feverfew compound, parthenolide, is not highly soluble in water, which makes it harder for pharmaceutical companies to extract the compound and patent it. They have to modify its structure slightly for it to still work to kill cancerous cells. But you could also just take the much less expensive herb, and get the compound as nature intended it. Feverfew can also be grown in your own garden, and you can take the herb to induce cancer cell apoptosis for pennies. I’m quite certain the American Medical Association and American Cancer Society wouldn’t want you to know that.